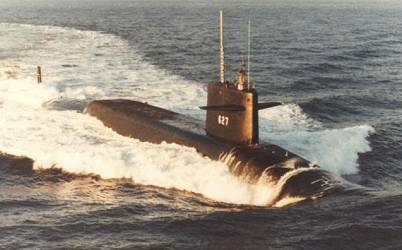 USS JAMES MADISON was the tenth LAFAYETTE - class nuclear powered fleet ballistic missile submarine and the second ship in the Navy to bear the name. Completed with the 2500-mile range Polaris A3, the JAMES MADISON was refitted with the Poseidon missiles between 1969 and 1978. In 1979-82, she received Trident I missiles. This section contains the names of sailors who served aboard USS JAMES MADISON. It is no official listing but contains the names of sailors who submitted their information. 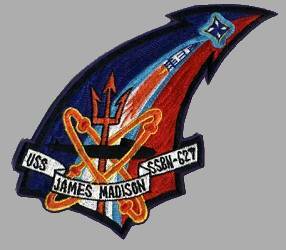 Click here to see which USS JAMES MADISON memorabilia are currently for sale on ebay. November 3, 1974 North Sea According to Jack Anderson's regular newspaper column of January 1, 1975, the USS JAMES MADISON collides with an unknown Soviet submarine in the North Sea. According to Anderson the two submarines came within inches of sinking each other. The JAMES MADISON proceeded to Holy Loch, Scotland, to effect repairs. The US Navy refused to comment on the incident.